I tried to do you a solid, Raleigh, but you let me down. I told you that King Buffalo was the cat’s pajamas and yet a whopping 15 of you turned out to have your faces melted on a Tuesday. For shame. Kicking off the night was the Southern-fried hard rock stylings of Raleigh’s Emerson Boozer. Up next was the female-fronted four-piece rock fury of Raleigh’s own The Hell No, who are set to open the bill at Slim’s on the first night of this year’s Hopscotch Music Festival. Vocalist Brenna could have been a jazz singer in another life. Imagine her in smoky rooms with even smokier eyeshadow, belting out a dolorous tune. Instead, she found herself in the heyday of modern turmoil and is not going to take it lying down. As the focal point of the band, she was sassy ferocious and biker fabulous while their bassist, Ash, expertly shredded and was able to keep up with Brenna’s chops as he sang backup. 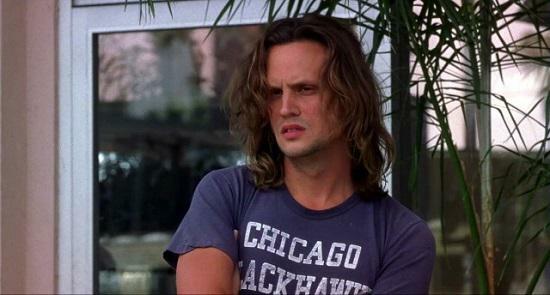 Side note: Adam on guitar looks like he could have been cast as Mark Kozelek’s character in Almost Famous. Alternating between a double-time ragers followed by a downtempo “feeling it” numbers made for a delightfully varied set by The Hell No. I expect big things from them in the future. Slim’s is a small venue but I happen to like it quite a bit. Over the years, I have seen some highlights such as Coliseum and Colossus lay waste to Slim’s 12-inch stage. It is an intimate venue that gets overlooked by many a band but it reminds me of the shitholes [I use the term lovingly. -Ed.] of downtown Lawrence, Kansas where I cut my teenage rock ‘n’ roll teeth. Plus, the bartender isn’t the kind of chap to ignore you for 15 minutes just to make some kind of self-serving point like a lot of purveyors of potent potables in this town. I would like to take a moment to ponder the mathematic improbability of seeing 3 different people wearing Soundgarden t-shirts at Slim’s over the course of that evening. Not that I don’t appreciate Chris Cornell and co. [I’ve always been more of an Alice in Chains sort of fella. – Ed.] but what are the odds? Did I miss another memo? As King Buffalo began to load in, I noticed a strange phenomenon: The venue started to empty. The problem was that only myself, and maybe that one other guy that was totally feeling it, had ever heard King Buffalo’s recently released psychedelic riff-fest, Orion. All the other patrons that night appeared to be the friends and family of the two local openers, who promptly left after the opening sets. [Portions of the bands themselves appeared to have stuck around because that is the classy thing to do. -Ed.] By the time KB were ready to rock, it looked like last call up in Slim’s, which is unfortunate because anyone that left missed one helluva set. King Buffalo is the kind of band that understands a proper rise and fall. They employ a lengthy build-up but also don’t neglect the pay-off. Your ears will first be dazzled by some trancey feedback manipulation, care of the intricate pedal setups for both guitar and bass, until KB deems that it is high time for some dank riffs. They employ a near-effortless groove that feels like a slow burn which culminated in some synchronized headbanging from all dozen of Raleigh’s finest concert-goers. Since I had been spinning Orion for a couple of weeks, I had to lead the sparse crowd in all the cheers at the end of songs since no one else knew when each song ended. I felt bad for King Buffalo. They brought the thunder but it was a Tuesday night and Raleigh decided they had better things to do. Your loss, Raleigh. If you are lucky, King Buffalo will swing back through in another year when they are a bigger draw because they are definitely on the rise.